This is Ahmet. Ahmet farms a few small fields and vines deep in Pigeon Valley. He took sincere interest in our hiking route this morning. He helped us scale steep, sandy trails and squeeze through narrow rock tunnels, preaching "technique" all the while. 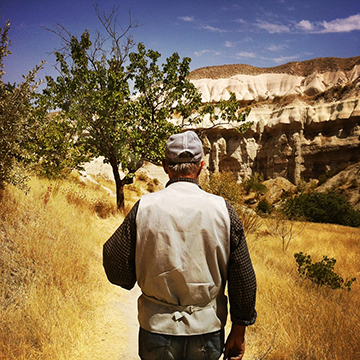 We are steps closer to Göreme. Teşekkür ederim, Ahmet! — in Üçhisar.